Drum corps people can often be classified as some of the biggest fanatics on the face of the Earth, living and breathing anything related to the marching music experience in their everyday lives. Here's just a small sample of recent drum corps topics compiled from fans' Facebook status messages. Jamie S. It's time to shop for more apparel from yet another drum corps---SCV! Congratulations Dustin and Brian!! Mike S. somehow, even after 2 days of pain, real life just isn't as cool as drum corps. Doug B. Congratulations to Miles and Evan for receiving contracts for First Flugelhorns in Drum Corps International's "Crossmen". Way to go guys ! Now off to the haberdasher with Evan's dad to get some bigger hats ! Chris C. Rain rain go away, come again another day..... that doesn't fall on a drum corps audition day. David A. Wow never thought I would be able to play from the show that got me into drum corps. Gotta love Bluecoats '07 closer! Nehemiah W. dream involving magic, drum corps, celebrity status, and snow. 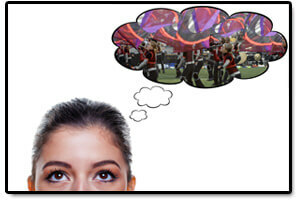 Allen G. What would happen if every college had their own competitive drum corps? Jeffrey O. concert was awesome tonight. the audience loved us. feels good when the audience goes crazy....like the old days of drum corps.